Caring for alpacas is not difficult, they are hardy animals that have spent thousands of years grazing on poor pastures in harsh weather conditions in their homeland, the Altiplano of South America. If you have the chance, time taken in planning your farm layout and paddock scheme in the first instance will pay dividends in the future ease of working with your alpacas. Alpacas do not challenge fences, this means that standard sheep fencing is sufficient. The recommended height for alpaca fencing is four foot. Alpacas winter outside and field shelters are provided for protection from rain rather than cold and sun during the summer. Some protection can be given by hedges and trees. Alpacas are induced ovulators, meaning that female alpacas do not have a breeding season, and can be bred at any point in the year, however, it is more usual to choose to have births from March to September when the weather is better. Female alpacas generally become sexually mature at one year of age and males at two years. Once a female is made pregnant the gestation period is eleven to eleven and a half months. Birthing usually occurs during the morning, a throw-back to their life on the altiplano, and the cria (baby) needing to be dry before nightfall and the chilling temperatures. Births are generally straightforward with complications being rare, although you will need to be on hand to deal with the umbilical cord and afterbirth. Weaning takes place at six months of age, when the cria is taken away from it's mother and placing it with others of similar age preferably out of sight of it's mother. 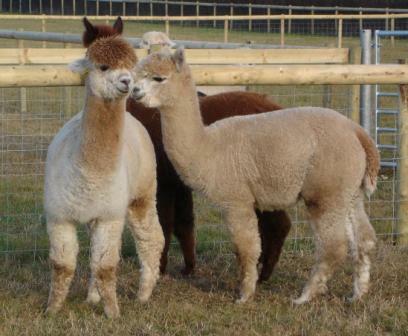 All British Alpaca Society registered alpacas need to be ear tagged and microchiped. All huacaya alpacas need to be sheared once a year. (Suri's are sheared every two years) You can learn to do this yourself, there are courses available. But if you would rather leave it to the professional, there are experienced alpaca shearers that travel the country they can visit your farm to do the shearing. At the same time the shearer can examine the alpaca's teeth to determine if they need any trimming and other routine vaccinations, worming or toe trimming can be carried out. Your alpaca will need regular "body scoring" to keep a check on their condition, with all their fleece an alpaca can hide its body condition, they can put weight on very quickly and the reverse, they can loose weight very quickly if they are sick. Regular condition scoring will alert you early to any changes. Alpacas require access to roughage (hay) all year. In addition to this, we feed a Camelibra supplement to cover the extras the alpacas require that are not found naturally from the land here in the UK. Alpacas will require Chlostridial vaccination and worming twice a year. Vitamins A,D & E are given by injection during the winter months. This can be done on the farm, you do not need a veterinary surgeon to carry out this proceedure. Alpacas will need their toenails trimming regularly, 3 - 4 times a year depending on growth, using sheep foot rot shears. It is recommended that you check on alpacas in the paddocks twice a day to ensure that they are fine and happy.